One of the most useful things in this day and age is a jacket that can be worn equally well with jeans and with formal, tailored trousers. These are roughly in ascending order of importance. 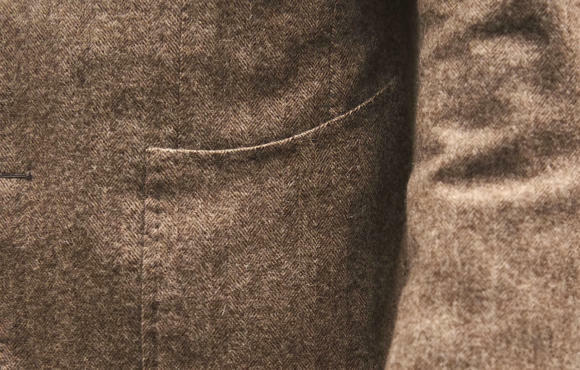 You can get away with normal flapped pockets, for example, but not with a square, structured cut. 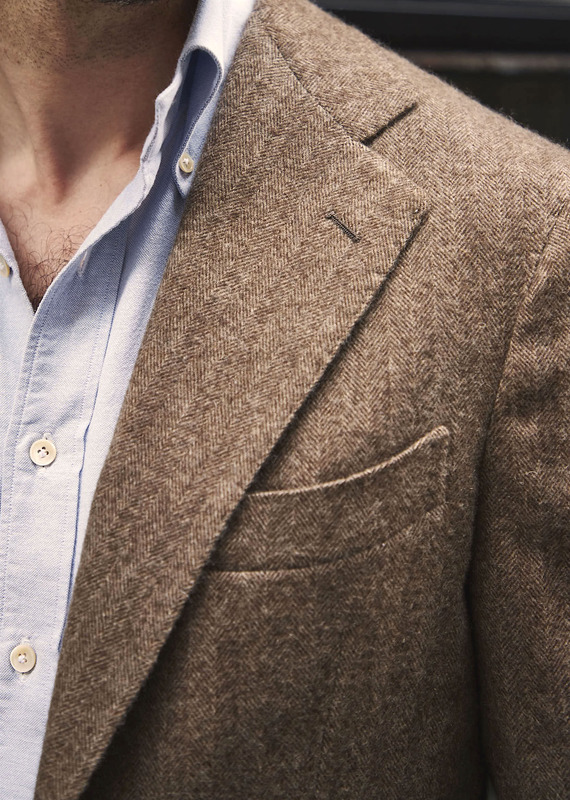 This jacket from Eduardo de Simone in vintage W Bill cashmere ticks all those boxes. It looks great here with jeans and a blue oxford, but could still be smart with a white shirt and charcoal trousers. Eduardo made me both a bespoke and made-to-measure version of this jacket, as he wanted me to compare and contrast the two - I’ll do that, and comment more on the fit of this one, in a separate post. The cloth is beautiful but, unfortunately, is a vintage piece that Eduardo had on hand from W Bill. He has enough for 2 or 3 other jackets. The jacket is a tiny bit shorter than most of my formal ones, but not much, with a back length of 31 inches (neck point to bottom edge). It has dark-brown horn buttons with some variegation. And pockets with nice curves to them. The hip pockets, though, are actually a little straighter than most Neapolitan ones - it’s the tops with their forward, curving slope, that draw attention. The jeans are the second pair I had made at Levi’s. (Bluer Cone Mills denim, with a slightly lower rise). Interestingly, I find a slim jean like this works better with tailoring than a wider one that's closer to the cut of a formal trouser. Wider jeans tend to lose their shape, and not have the clean, straight line of a slim leg. The ones from Anglo-Italian also have that approach, while the Armoury ones I have are wider. The shoes are unlined Edward Green Dovers, in dark brown ('mink') suede and thin rubber soles. Going back to our post a couple of weeks ago on Gaziano & Girling’s Fresco range, I do find that these unlined Dovers lose their shape a little and look more casual as a result. But they're also fantastically comfortable, and are one of the few styles I have that can bridge smart and very casual outfits. Shoes that fall into this category perhaps include split-toe derbys, loafers and boots, often in casual materials like suede or cordovan, and usually on slightly more casual, rounded lasts. One way I define this category of shoe is that it has to be casual enough to work with non-tailored jackets - like the Sapayol leather jacket I reviewed recently. The shirt was made bespoke by Luca Avitabile in our exclusive PS Oxford fabric. There about 12 lengths of that fabric left to make bespoke, and a ready-made shirt in the same style should be available next week. Oh, and I didn’t wear a pocket handkerchief. I find it feels out of place these days with such a casual outfit. 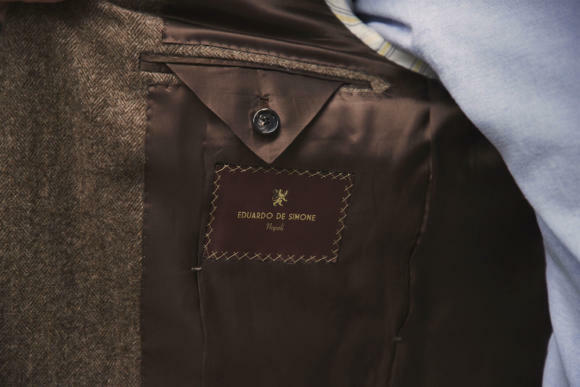 You can follow the discussion on Jacket and jeans: vintage cashmere from Eduardo de Simone by entering your email address in the box below. You will then receive an email every time a new comment is added. These will also contain a link to a page where you can stop the alerts, and remove all of your related data from the site. Simon – what kind of shoulders does this jacket have? I can’t see any prices in this article. Also, where would you access the MTM product ? The prices are available on the longer piece on Eduardo here. The MTM is something largely accessible through other brands Eduardo’s factory works for, while the bespoke is only available by meeting Eduardo or going to Naples. Basically, it’s very hard to buy – something worth remembering for those that now and again say the site is too commercial! If you want to sell one of the jackets (as you have two!!!) I am a very similar build!!! Email in comment submission!!! Would a darker brown work better or not be so casual? Great looking jacket, Simon, and it’ll be good to read your view on its fit, along with your observations on the MtM jacket too. I agree with your view on the suitability of more structured British jackets for wearing with very casual shirts and trousers, particularly with denim, although it’s a view that has only recently crystallised in my mind. It’s a look that I’ve tried to pull off with traditional British jackets in the past, but gave up on because it never looked right somehow. It’s been very helpful to read your comments on relevant jacket styles and, having successfully tried two more softly styled, casual jackets in the summer (one RTW, the other MTM), I get it and am about to commission a bespoke autumn/winter jacket (or two!). I’m an independently minded person, quite happy to form my own views (that philosophy degree left its legacy! ), but one of the great strengths of this blog is that many of your posts (and those of fellow readers) often help to crystallise unresolved feelings that one may feel intuitively, but struggle to articulate and resolve. 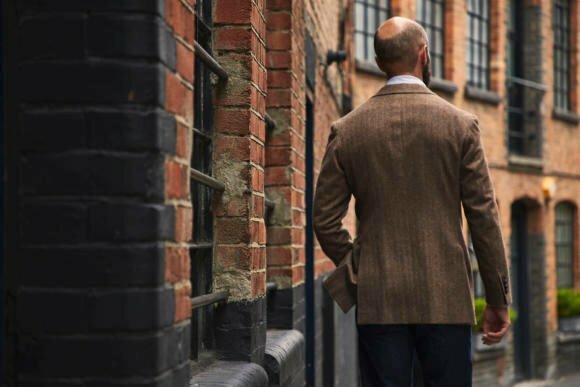 In this case, it’s been helpful because my entire experience of “casual jackets” has been of relatively traditional British ones and the many posts on Italian tailoring have pointed me in a direction which has prompted me to explore an unfamiliar aspect of tailoring and has introduced me to a new (for me) with very satisfactory results. 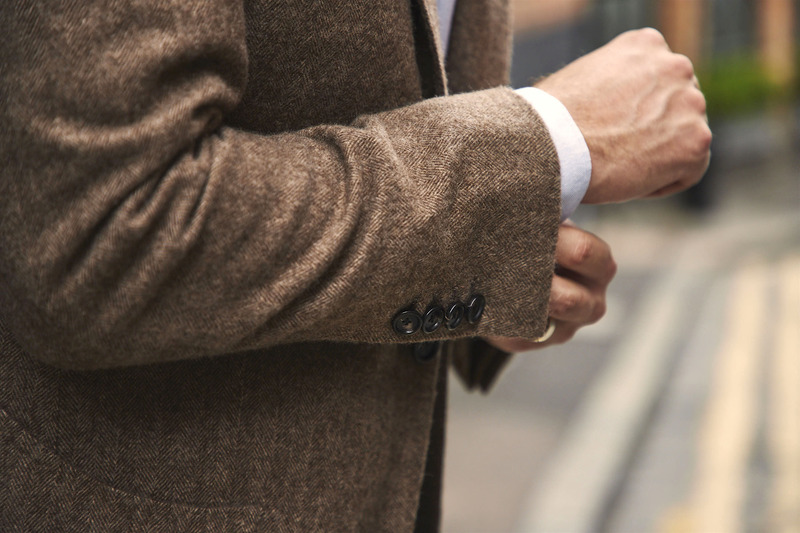 Still a fan of good structured British suits though…. Well they say style timeless. Tweed jacket, Oxford button down, denims and suede dessert boots was my daily uniform at university. Nice jacket and cloth. The LP équivalent looks like a blazer fabric. Does a low buttoning point make a jacket more casual? Simon I love your taste. I only want to make a gentle observation which is this open shirt flapping about with chest hair visible is just not the way to go. You have been doing this repeatedly and you should perhaps button the button. I agree with not wearing a tie with jeans which we Yanks do and it is a ridiculous look. I do not mean to offend. 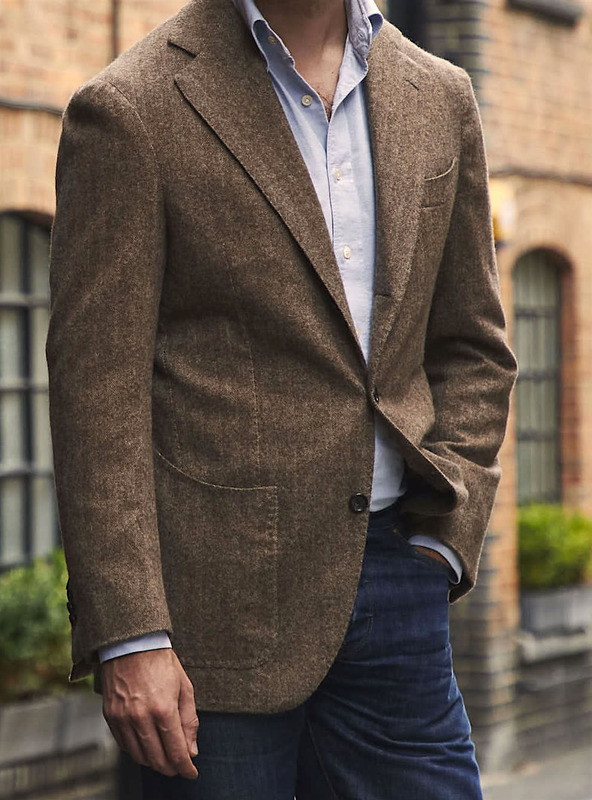 From the pics (and I know pictures aren’t very representative) it looks almost identical to the Joshua Ellis cashmere on your Richard James jacket – or is that just me? By the way I like the jeans. As much as I love the superior make of BLA, these fit and look better – maybe a little mini lesson in that! You’re right, it does look similar, but is rather different in person. A more muted colour, a much fluffier finish, and more importantly a big difference in weight. Wow, those pockets. They do curve quite a bit. I didn’t notice their full effect until the last picture. How do you feel about them, a few days in? To be honest I don’t mind them – I don’t think the effect is as extreme in person as that one shot shows. But I might still have regular patches if I commissioned the same thing again. I’ve only seen that bunch briefly I’m afraid so I can’t comment much on what it would be suitable for. I agree with Oskar; it’s an overall gorgeous jacket and I think it works pretty well with jeans, but the pockets are a bit idiosyncratic – difference for difference’s sake. 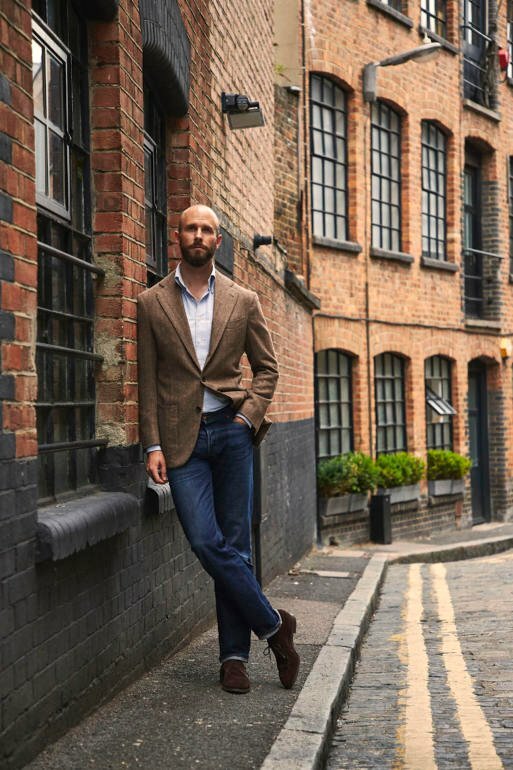 Hi Simon, interesting mention about a slim jean looking better than a wider one with tailoring, I agree. Looking into this further, what outfits would you say a wider jean closer to a formal trouser cut looks better than slim (not skinny)? Personally, I find the only thing that does are my CP’s due to their length – which have a close silhouette to a formal shoe. But a formal shoe (rounded or elongated) looks odd with a wider jean. Very interested to know your thoughts. Hello Simon, You said the Loro Piana cloth is lighter in weight, is it still appropriate for tailoring purposes? And will you be able to provide the number of the cloth. Thank you. Given that the color is brown would the shade need to change depending on skin tone in order to avoid the ‘washed out’ look (particularly thinking of Asian/ South Asian complexions )? The jacket hits all the right points except for the weird patch pockets. In that last pic, the backwards sloping line, seen with the front darts, suggests that the pocket rises exponentially into the armpit. With dark denims a traditional brown leather jacket still works best. It essentially echoes, with some variation, the classical Preppy style of sports coat, stylish casual trousers and button down with Bass Weejuns or suede loafers. Question: you now look to slim Italianate lines for ‘casual’ jackets. These shapes mesh with modern slim line fashion (the key menswear silhouette 2005-2015). The classical more structured look in UK tailoring is, in a fashion sense, older. As the fashion wheel turns to fuller, larger silhouettes (as it has in Milan – Armani, Versace, Lanvin etc. – larger, looser, more fluid lines – wider width trousers) and the slim silhouette will move out of fashion do you think your sensibilities will then alter leaving behind slim moving to accepting a larger, more fluid silhouette as a casual go to? It’s hard to say, given these menswear trends take a decade or so to pass through, but I think it will only be in small changes. The jeans might get a tiny bit wider. But the jacket wouldn’t change that much. This is actually not that slim – it has a slightly extended shoulder, some drape in the chest, and is a decent length. If you let out the waist a little, it would look quite roomy. And this is where tailoring will go with trends, if it does. The key in classic dressing like this is moderation. The jackets that will look out of date are the super-slim, super-short ones offered by most high-street retailers in recent years, and a lot of Neapolitan brands. The fashion wheel turning to fuller silhouettes? That’s highly unlikely. The signs are all around us. Versace has been bought by Michael Kors (remember that business decisions DO affect design choices). Only this week, Hedi Slimane gave an interview to some French paper and it was like God condescending to descend from Mount Olympus, with the journalist bowing and scraping. New and Lingwood pin back the jackets on their display models to achieve 20-inch waists. Male models, even in the sartorial industry (vide the ubiquitous bloke who does Drake’s, New & Lingwood, and others) are built like stick insects. And so on. Slim fit is here to stay. The fashion industry is going to need something new to sell. Wider silhouette like Armani in the 80s are not at all unlikely. You mentioned that cordovan is ‘casual’ here. Could you explain why this is so? Is it because that cordovan is usually brown, or is it something to do with its texture? I have a pair of cordovan shoes and they seem to shine in the same way as calf leather, so they have always seemed as formal as a similar pair of leather shoes in a similar colour. Cordovan is a thicker leather, and will usually look like it has more heft as a result. It doesn’t really polish in the same way as calf, not as high a shine, and many people prefer not to polish it therefore, but keep its natural glow with buffing and cream. It’s more usually seen in burgundy rather than brown or black, but can of course be in those colours. Great look for sure. I’m thinking of having a jacket made up by Saman Amel in a similar fabric, I believe the swatches I’ve seen are from their Loro Piana books. What’s your view here Simon, better to go with a 12-13 oz rather than 14-16 oz? If I understood comments elsewhere on PS this is your full time occupation now Simon. Now that you don’t work in an office do you find your style and approach to everyday dress changing? Good question, and definitely one that deserves its own post…. I usually wear Jacob Cohën jeans (model 688). Unfortunately they are getting more expensive each year, prices above 350 euro are very normal. That’s why I am looking for a good alternative. I am looking for slim fitting jeans with a narrow foot width. What do you recommend? Mike, How about Seven for all Mankind? Ideally the European not the US ones. About €250. Simon, a lot has been said in the past about the buttoning point you have on your jackets but there is a clear shot here about how wring you have them. Your jeans are about your natural waist, but the button seems about three inches above that, suggesting by any normal measure that its about 1.5” too high. Next time you commission something, ask your tailor to guide you. It will elongate the torso, and look much better on you. No, the jeans are on my hips – definitely not my natural waist. My jacket buttoning is at my natural waist. In fact, on this jacket, slightly below it. The buttoning point is actually lower than most of the bespoke tailors I have used. As to your last point, I have taken tailors’ advice on these points, probably to a fault, over 10 years and from over 40 tailors. Yet you still seem to consider them all wrong. I thought the lower button was generally at the level of the pants, not the buttoning point. Otherwise it would look odd. On a high waisted trouser, the waist of the trouser would be at the same height as the buttoning point. See my Panico suit for example. Try Hiut slim fit. Lovely jeans and reasonably priced. Hi Bobby, I mention wider fit from seeing , over the last 3 years or so, on the premium luxe brands Milan, Paris, London catwalk shows a definitive move to these silhouettes. Laver’s law suggests long term fashion trends repeat in 20 year cycles. Mainstream silhouettes tend to move, usually, in 8-10 year cycles, taking 3-5 years to ‘safely’ catch up with leading fashion brands (cycling through introduction, rise, peak, decline, rejection). Messing with all of these cycles is social media; bringing forth new trends overnight, extending out of date trends and ending trends not yet developed. As evidence of new silhouettes developing – extra width women’s trousers were on Italian catwalks 3 years ago, on the streets of Milan last year and in UK stores this year. In 8 years time slim cut trou. will be viewed with the same regard as the bootcut style, prevalent in 2010, is viewed now (familiar but now out of fashion). As for Kors – media reports confirm he will focus more on accessories and footwear – tailoring may take a backseat. For those interested it’s worth reading Anders Christian Madsen on who is shaping fashion in the luxe brands (Vogue 25 Jul 2018). Great article (as usual). I have been thinking of getting a jacket which I could wear with jeans too. As you pointed out it is important that the jacket present enough casual features – in that sense, I was thinking of getting an unlined or half-lined jacket with no canvas. What time of fabric would you recommend I consider? I’d like it to be a three season jacket. Are there any particular types or weight of fabrics that I should prefer given the absence of canvas? I would not want the jacket to lose its shape over time (cashmere is notorious for that). To be honest I would recommend avoiding an uncanvassed jacket if you want anything with some line or structure. It will end up looking more like a sweater without it. Unlined yes, but with a light canvas. How can they be bigger, if they are made on the same last as the lined versions? The last defines the space inside the shoe, irrespective of whether there is a lining or not. Not sure if it is clear what I mean here…. My experience with tight fitting lined and unlined rock climbing shoes is that the lining preserves the manufactured shape of the shoe. A lined shoe will mould to the foot where there is pressure but an unlined shoe will reshape around the whole foot. Perhaps that gives the sense of roominess and comfort in these without really growing in size. What is the advantage of Italian tailoring in regards to the Savile Row or shall I say English tailoring.? t is a fantastic jacket make no mistake about that. But could the same tailoring be done at Savile Row? with same or similar fabrics? Or can this particular jacket only be made in Italy? This type of jacket couldn’t be made on Savile Row, no, because of the structure inside and because of the style of the cut. Structure is not easy to change, and learn to make differently with, and style is even harder, being something not easy to copy. Although there are some in England that make much softer jackets, they’re never as casual as Neapolitan ones such as this. It seems like I will have to take a trip. I also wonder if you can make a sort of priority list for when it is a clear advantage to choose bespoke tailoring? Myself I see a clear advantage in jackets, suits and shirts. Very uncertain about shoes. Knitwear is not on my bespoke list unless it is homemade. I hope I manage to explain. Lovely look, Simon! I’d prefer jeans with a slightly higher rise, I think it works better with a jacket. And I think that it’s a bit funny that we consider these jeans “slim”. Definitely compared to the wider fitting jeans out there, but not compared to the slim fitting jeans most brands sell. These look to be rather straight from the knee down and you seem to have some room left around the thighs. So while slim, definitely not slim fit compared to fashion brands. 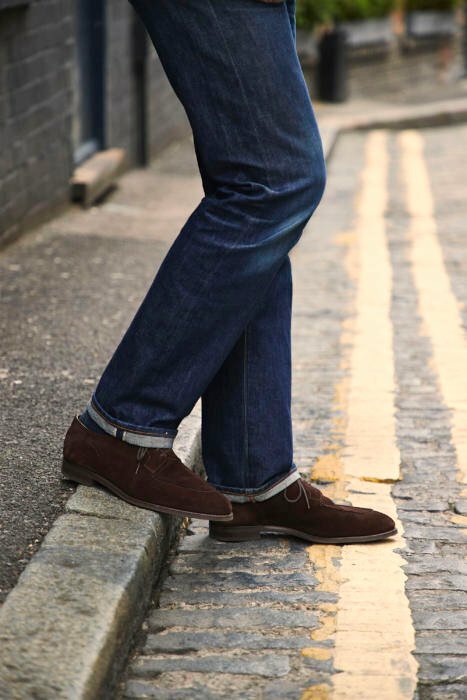 The straight fitting jeans from brands like Blackhorse lane or COF are pretty much the perfect fit for with and without jackets in my opinion. I like the curved patch pockets. They mirror the curve of the chest pocket and are gracefully cool – refined yet relaxed. Consider some grey jeans, solid or textured. 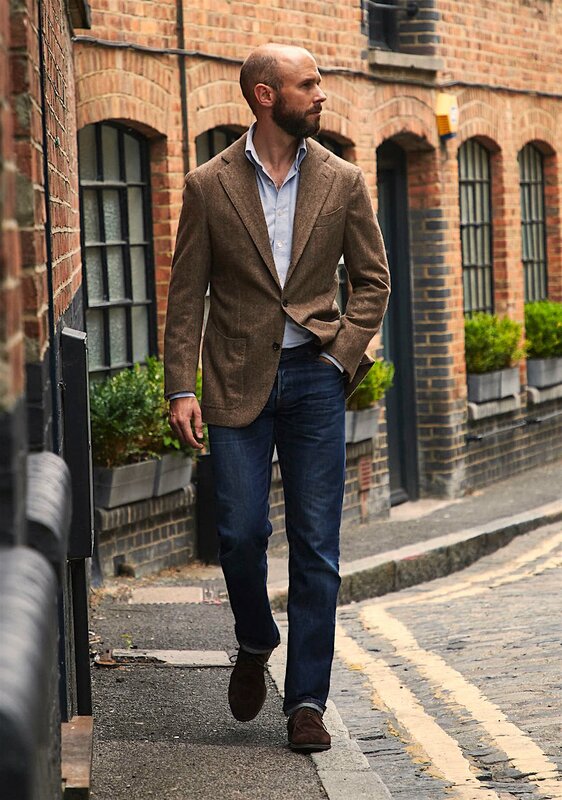 A touch smarter than standard blue denim, so they close the formality gap between jacket and jean a bit, making it possible to wear slightly smarter jackets. I wear grey jeans where dark blue jeans would be too casual and grey trousers too formal. Comfy too, in stretchy fabric. Definitely agree re lack of pocket square. Hi Simon, I´m curious as to what Dover would you recommend between the Dark Oak and the Redwood for a second pair? I have a pair in espresso suede which I love, but want something in smooth leather. I can get the Redwood at a significant mark-down, versus full price for the Dark Oak (which is the one I would really want… hence the doubts). As always your thoughts will be much appreciated! Thank you Simon! A quick follow up: would you wear the dark oak with denim/chinos, or only tailored trousers? Enjoy Florence! Could navy Incotex chinos replace the jeans in an outfit like this?